If you think about it, this could be immersive. I'm talking about you'd probably feel something in the lock if you tried this in real life (I wouldn't know and I can't confirm this). sooo... ummm... where do i put it ? You need to run the game through the Fallout Script Extender (FOSE) loader. If you create the folders and put the dll there it will work. I'd probably install this if you made the debug menu appear with a perk or something. Looks promising. Damn son, was this a menu the devs disabled in the game? Yes, type ShowLockpickMenuDebug in console. I just found where the game checks whether it should show the debug menu or not (it’s just a flag) and made it always true. 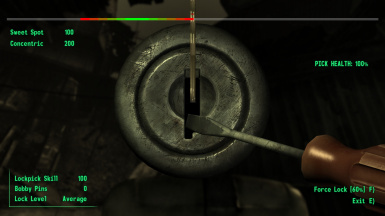 Its easy to lockpick now.